"Spherical triangle" redirects here. For triangles in the Euclidean plane with circular-arc sides, see Reuleaux triangle. Spherical trigonometry is the branch of spherical geometry that deals with the relationships between trigonometric functions of the sides and angles of the spherical polygons (especially spherical triangles) defined by a number of intersecting great circles on the sphere. Spherical trigonometry is of great importance for calculations in astronomy, geodesy and navigation. The origins of spherical trigonometry in Greek mathematics and the major developments in Islamic mathematics are discussed fully in History of trigonometry and Mathematics in medieval Islam. The subject came to fruition in Early Modern times with important developments by John Napier, Delambre and others, and attained an essentially complete form by the end of the nineteenth century with the publication of Todhunter's textbook Spherical trigonometry for the use of colleges and Schools. Since then, significant developments have been the application of vector methods, and the use of numerical methods. Eight spherical triangles defined by the intersection of three great circles. A spherical polygon is a polygon on the surface of the sphere defined by a number of great-circle arcs, which are the intersection of the surface with planes through the centre of the sphere. Such polygons may have any number of sides. Two planes define a lune, also called a "digon" or bi-angle, the two-sided analogue of the triangle: a familiar example is the curved surface of a segment of an orange. Three planes define a spherical triangle, the principal subject of this article. Four planes define a spherical quadrilateral: such a figure, and higher sided polygons, can always be treated as a number of spherical triangles. From this point the article will be restricted to spherical triangles, denoted simply as triangles. The basic triangle on a unit sphere. Both vertices and angles at the vertices are denoted by the same upper case letters A, B and C.
The angles A, B, C of the triangle are equal to the angles between the planes that intersect the surface of the sphere or, equivalently, the angles between the tangent vectors of the great circle arcs where they meet at the vertices. Angles are in radians. The angles of proper spherical triangles are (by convention) less than π so that π < A + B + C < 3π. (Todhunter, Art.22,32). The sides are denoted by lower-case letters a, b, c. On the unit sphere their lengths are numerically equal to the radian measure of the angles that the great circle arcs subtend at the centre. The sides of proper spherical triangles are (by convention) less than π so that 0 < a + b + c < 3π. (Todhunter, Art.22,32). The radius of the sphere is taken as unity. For specific practical problems on a sphere of radius R the measured lengths of the sides must be divided by R before using the identities given below. Likewise, after a calculation on the unit sphere the sides a, b, c must be multiplied by R.
The polar triangle associated with a triangle ABC is defined as follows. Consider the great circle that contains the side BC. This great circle is defined by the intersection of a diametral plane with the surface. 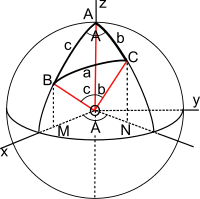 Draw the normal to that plane at the centre: it intersects the surface at two points and the point that is on the same side of the plane as A is (conventionally) termed the pole of A and it is denoted by A'. The points B' and C' are defined similarly. Therefore, if any identity is proved for the triangle ABC then we can immediately derive a second identity by applying the first identity to the polar triangle by making the above substitutions. This is how the supplemental cosine equations are derived from the cosine equations. Similarly, the identities for a quadrantal triangle can be derived from those for a right-angled triangle. The polar triangle of a polar triangle is the original triangle. The cosine rule is the fundamental identity of spherical trigonometry: all other identities, including the sine rule, may be derived from the cosine rule. These identities approximate the sine rule of plane trigonometry when the sides are much smaller than the radius of the sphere. The other cosine rules are obtained by cyclic permutations. the spherical sine rule follows immediately. There are many ways of deriving the fundamental cosine and sine rules and the other rules developed in the following sections. For example Todhunter gives two proofs of the cosine rule (Articles 37 and 60) and two proofs of the sine rule (Articles 40 and 42). The page on Spherical law of cosines gives four different proofs of the cosine rule. Text books on geodesy (such as Clarke) and spherical astronomy (such as Smart) give different proofs and the online resources of MathWorld provide yet more. There are even more exotic derivations, such as that of Banerjee who derives the formulae using the linear algebra of projection matrices and also quotes methods in differential geometry and the group theory of rotations. which is the first of the sine rules. See curved variations of the Law of Sines to see details of this derivation.
. Similar techniques with the other two cosine rules give CT3 and CT5. The other three equations follow by applying rules 1, 3 and 5 to the polar triangle. Another twelve identities follow by cyclic permutation. The proof (Todhunter, Art.49) of the first formula starts from the identity 2sin2(A/2) = 1–cosA, using the cosine rule to express A in terms of the sides and replacing the sum of two cosines by a product. (See sum-to-product identities.) The second formula starts from the identity 2cos2(A/2) = 1+cosA, the third is a quotient and the remainder follow by applying the results to the polar triangle. Another eight identities follow by cyclic permutation. When one of the angles, say C, of a spherical triangle is equal to π/2 the various identities given above are considerably simplified. There are ten identities relating three elements chosen from the set a, b, c, A, B.
Napier provided an elegant mnemonic aid for the ten independent equations: the mnemonic is called Napier's circle or Napier's pentagon (when the circle in the above figure, right, is replaced by a pentagon). Similar substitutions in the other cosine and supplementary cosine formulae give a large variety of 5-part rules. They are rarely used. The solution of triangles is the principal purpose of spherical trigonometry: given three, four or five elements of the triangle determine the remainder. The case of five given elements is trivial, requiring only a single application of the sine rule. For four given elements there is one non-trivial case, which is discussed below. For three given elements there are six cases: three sides, two sides and an included or opposite angle, two angles and an included or opposite side, or three angles. (The last case has no analogue in planar trigonometry.) No single method solves all cases. The figure below shows the seven non-trivial cases: in each case the given sides are marked with a cross-bar and the given angles with an arc. (The given elements are also listed below the triangle). There is a full discussion of the solution of oblique triangles in Todhunter (ChapterVI). Case 1: three sides given. The cosine rule may be used to give the angles A, B, and C but, to avoid ambiguities, the half angle formulae are preferred. Case 2: two sides and an included angle given. The cosine rule gives a and then we are back to Case 1. Case 3: two sides and an opposite angle given. The sine rule gives C and then we have Case 7. There are either one or two solutions. Case 4: two angles and an included side given. The four-part cotangent formulae for sets (cBaC) and (BaCb) give c and b, then A follows from the sine rule. Case 5: two angles and an opposite side given. The sine rule gives b and then we have Case 7 (rotated). There are either one or two solutions. Case 6: three angles given. The supplemental cosine rule may be used to give the sides a, b, and c but, to avoid ambiguities, the half-side formulae are preferred. Case 7: two angles and two sides given. Use Napier's analogies for a and A. The solution methods listed here are not the only possible choices: many others are possible. In general it is better to choose methods that avoid taking an inverse sine because of the possible ambiguity between an angle and its supplement. The use of half-angle formulae is often advisable because half-angles will be less than π/2 and therefore free from ambiguity. There is a full discussion in Todhunter. The solution of triangles article presents variants on these methods with a slightly different notation. Another approach is to split the triangle into two right-angled triangles. For example, take the Case 3 example where b, c, B are given. Construct the great circle from A that is normal to the side BC at the point D. Use Napier's rules to solve the triangle ABD: use c and B to find the sides AD, BD and the angle BAD. Then use Napier's rules to solve the triangle ACD: that is use AD and b to find the side DC and the angles C and DAC. The angle A and side a follow by addition. Not all of the rules obtained are numerically robust in extreme examples, for example when an angle approaches zero or π. Problems and solutions may have to be examined carefully, particularly when writing code to solve an arbitrary triangle. where E is the amount by which the sum of the angles exceeds π radians. The quantity E is called the spherical excess of the triangle. This theorem is named after its author, Albert Girard. An earlier proof was derived, but not published, by the English mathematician Thomas Harriot. On a sphere of radius R both of the above area expressions are multiplied by R2. The definition of the excess is independent of the radius of the sphere. Since the area of a triangle cannot be negative the spherical excess is always positive. Note that it is not necessarily small since the sum of the angles may attain 5π (3π for proper angles). For example, an octant of a sphere is a spherical triangle with three right angles, so that the excess is π/2. In practical applications it is often small: for example the triangles of geodetic survey typically have a spherical excess much less than 1' of arc. (Rapp Clarke, Legendre's theorem on spherical triangles). On the Earth the excess of an equilateral triangle with sides 21.3 km (and area 393 km2) is approximately 1 arc second. Angle deficit is defined similarly for hyperbolic geometry. ^ a b c d e f g h i j k l m n o p Todhunter, I. (1886). Spherical Trigonometry (5th ed.). MacMillan. ^ Smart, W.M. (1986). Text-Book on Spherical Astronomy (6th edition). Cambridge University Press. The fourth edition is online at archive.org. Chapter 1 is on spherical trigonometry with numerical examples. ^ W., Weisstein, Eric. "Spherical Trigonometry". mathworld.wolfram.com. Retrieved 8 April 2018. ^ Delambre, J. B. J. (1807). Connaissance des Tems 1809. p. 445. ^ Another proof of Girard's theorem may be found at . "Revisiting Spherical Trigonometry with Orthogonal Projectors" by Sudipto Banerjee. The paper derives the spherical law of cosines and law of sines using elementary linear algebra and projection matrices. A Visual Proof of Girard's Theorem by Okay Arik, the Wolfram Demonstrations Project. "The Book of Instruction on Deviant Planes and Simple Planes" is a manuscript in Arabic that dates back to 1740 and talks about spherical trigonometry, with diagrams. Some Algorithms for Polygons on a Sphere Robert G. Chamberlain, William H. Duquette, Jet Propulsion Laboratory. The paper develops and explains many useful formulae, perhaps with a focus on navigation and cartography.